As he concluded the inaugural iPad event back in January 2010, Steve Jobs summed up Apple’s mission in a single slide. Two street signs were labeled Technology and Liberal Arts, and he explained that Apple operates at the intersection. With Apple Watch, Apple seems to have added a new cross-street: fashion. Where good looks have always been somewhat secondary to Apple devices usability, the company’s first wearable is all about style, so much so that for its first public appearance Apple chose one of the hippest boutiques in Paris during Fashion Week, not the Apple Store at Carrousel du Louvre. Back when the iMac G3 was unveiled, the lowercase I in its name stood first and foremost for Internet, but it wasn’t just the ability to get online. It was about connection, and about individuality. The iMac was the most personal computer Apple had ever created, an eye-catching mix of technology and art. As I watched Tim Cook unveil Apple’s wristwatch, I couldn’t help but think of the iMac, not just because he was standing on the same stage where Steve Jobs had introduced the iMac, but because of the connection Apple had forged between user and gadget. There’s still a lot that we don’t know, but from what Apple demonstrated, its first wearable is a true “I” device. It’s crafted to be intensely personal, since you wear it all day and it can tap you on the wrist or even show your heartbeat. For months leading up to the event, the rumors were all joking calling this product the iWatch, so much so that it was easy to assume that Apple might continue its popular naming convention with this new category. But that was before we saw what Apple had been working on. The world has become inundated with “i” products—everything from screen protectors to stock photo services have adopted that lowercase letter to capitalize on the Apple’s popularity. But the Apple logo is different. Like the Rolex crown or Gucci’s interlocking G’s, it stands for luxury. By using its logo in place of the “i,” Apple is looking to align itself with TAG Heuer and Raymond Weil, not Samsung or Swatch. Its new watch may be the most personal device Apple has ever made, but it’s also the most luxurious. Mac fans have always awarded extra points for good design, but with Apple Watch, Apple is appealing directly to people’s sense of style in a whole new way. 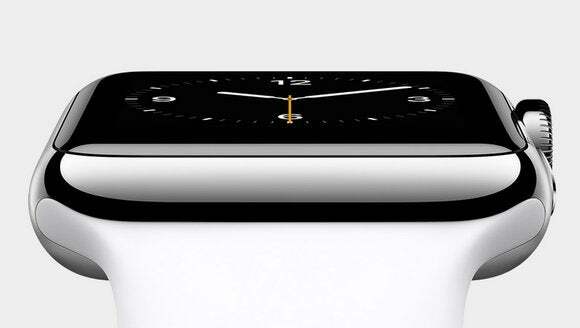 While the smartwatches from Samsung, Motorola, and LG look like gadgets, the Apple Watch is jewelry. Take away its smarts, and Apple Watch can still hold its own against the Breitlings and Cartiers of the world. Apple has crafted two sizes out of six materials and then upped the ante with 22 interchangeable bands, sporty to swanky. That leads to a wide variety of combinations, and likely an equally wide price range. John Gruber recently speculated that the highest-end 18K gold model could sell for upwards of $9,999. If he’s right, that could make it the most expensive product in Apple’s catalogue, since a fully maxed-out Mac Pro is a hair under 10 grand too. That’s not just a new category, it’s a whole new philosophy, one that fits more on the runways of Milan than the halls of CES. Apple isn’t just selling a smartwatch. It’s selling a fashion accessory that happens to have a Bluetooth LTE chip. With the iMac, Apple showed the world that personal computers could make a statement. The gold iPhone 5s injected a class shade into the usual color array. The Beats Music purchase brought a hip headphone brand under its umbrella. But make no mistake: Apple Watch is a full-on entrance into the world of fashion. And it should be a great fit. The luxury watch market might not be as big as the smartphone one, but there’s more than enough room for Apple to make its mark. With its sleek enclosure and digital crown, Apple Watch is as striking on the outside as a Bulgari Endurer or Franck Muller Vanguard, but its customizable face and interchangeable bands make it unlike any of its peers (and no, I don’t count Samsung’s Gear watches among them). Assuming developers write plenty of apps for it, and Apple adds features with updates, the watch could adapt to the times as quickly as it does to your outfit. But that’s actually a point for dumb watches too—after all, you can keep a Rolex forever without worrying when the company will stop providing OS updates for it. While we don’t know much about the Apple Watch’s specs, this time it really doesn’t matter—its looks and the experiences it can provide are what’s going to really count. Besides a fancy way to tell time, it can serve as a wearable link to your iPhone, a sensor-laden fitness tracker, and a new way to interact with your friends. But even when it’s not doing any of those things, it’ll still look darn good on your wrist.